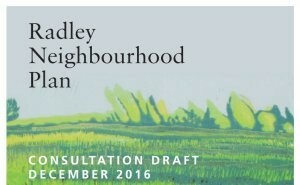 Radley Parish Council publishes its draft Neighbourhood Plan today. The Plan can be viewed here. Hard copies are available free of charge from the Radley Village Shop. There will be presentations on the draft Plan and an opportunity to ask questions in the Village Hall on Wednesday 18 January at 7.30 pm and on Sunday 22 January at 3.00 pm. Views on the Plan may be submitted online here or sent to Radley Parish Clerk, 73 Eaton Road, Appleton, Abingdon OX13 5JJ, clerk@radleyvillage.org.uk. The deadline for comments is 10 February 2017.